Manage, organise and track your payments to vendors. This includes the tracking of cash, eft, credit card and any other types of payments to vendors. The Accounts Payable menu is for the entry of all Transactions that are involved with the payment of all invoices for the company and this includes the recording of cash payments in the system. These records directly affect the General Ledger and are normally based upon paper documents. This menu also allows the recording of payments when money is paid out. The SapphireOne solution automates the processes required to effectively manage your expenses and purchases with features that assist in the tracking and processing of all your payments. 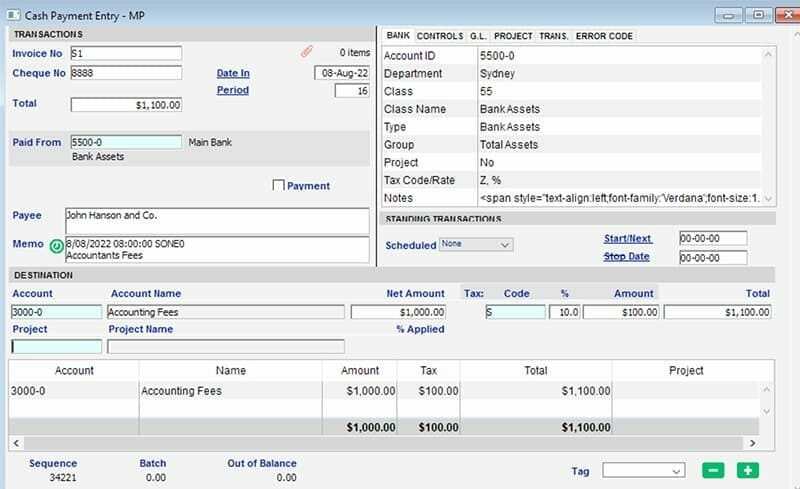 Fully integrated within the SapphireOne solution, transactions from within the Accounts Payable mode are updated across the system to your General Ledger. 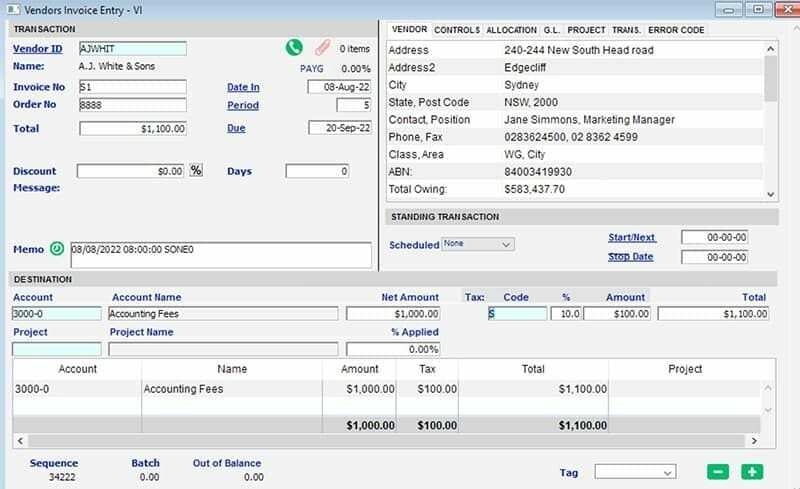 This allows the processing of Requisitions and Purchase Orders right through to reconciling these transactions using the built-in Bank Reconciliation function. While automatic cheque-based transactions and printing of cheques are still provided for, the generation of eft-based payments is now a key feature of the SapphireOne Accounts Payable system. This presents in real time an accurate overview of the position of your business at any given time. SapphireOne has the ability to store all cash based transactions as an electronic record. This means that all cash payments are recorded and as such also transferred to the general ledger accounts automatically when posted. Cash Payment (MP) is used when no vendor details are available for entry into the transaction. Selection of the relevant bank account will determine what type of payment is used. For example, cheque, credit card or cash accounts, which are set up in the General Ledger. If a vendor has supplied an invoice this may be scanned and attached to this cash payment record for future reference. The SapphireOne vendor invoice stores all vendor-related information within the transaction, as well as the related purchase lines, and can store project costing at each inventory line if required. At the same time, once the vendor purchase has been posted in inventory mode an automatic vendor invoice in accounts payable is created. Vendor Invoices (VI) is for the entry of vendor invoices to the General Ledger (Bills). Provision is made for the user to select and enter the general ledger account and the dollar amount for this invoice. If this invoice is to form a part of a Project (Child), a project ID may also be entered which will then link this vendor invoice to the project. This invoice will then become a part of the costings for the project. The credit memo function allows for the entry of credits, for example, when goods are returned to the vendor. As for other functions within the SapphireOne system, a Vendor ID is needed for the entry of details and it is very similar to the other functions in Payables. Credit Memo (VC) allows the entry of credits, for example, when goods are returned to the vendor. A Vendor ID is needed. Once the Credit Memo has been entered, select the green tick on the main toolbar. The system will then display the normal Allocation screen enabling Allocation of the amount in the Credit memo against a Vendor Invoice. A journal is used to make adjustments to vendor balances. The entry procedure is very similar to a Cash Payment or a Vendor Invoice. Vendor Journal (VJ) is used when vendor balances need adjustment. While this is a Journal, it only has a single line which may be entered as a credit or a debit.The system will then automatically auction the appropriate amount against the Accounts Payable General Ledger account to create a zero balance journal. Data entry for this function is very similar to the Cash Payment screen in Receivables with some minor differences. Vendor Payments (VP) handles the payment of money to vendors for payment of accounts. It is similar to Cash Payments but additional data entry fields are provided for the entry of vendor details. Required vendor payment details have been entered and the green tick selected. The system will automatically display the allocation screen enabling simple and quick selection of the invoices to be allocated to this vendor payment. There are four Inquiry screens that allow you to search and access your main Client files. There are – Transactions, Allocations, Vendor and Class. Transaction Inquiry presents a window containing all current activities with all transactions listed by default in descending Sequence number order. From this window you can View or Look at all Transactions. You may also Manipulate and Modify Transactions that are currently un-posted. Each column shows information from particular fields of each transaction. Transactions are listed in order of entry with the most recent at the top. Like other List Windows you can manipulate the information seen by highlighting and using functions from the Options Menu. There are several Transaction Types which are displayed in the Transaction Inquiry Window. Each type is indicated by a two-letter code. The first letter of the code indicates Where the transaction originated. Using this code system, a Cash Receipt is coded MR, a Cash Payment shown as MP, and a Vendor Invoice is a VI. If the transaction originated in Inventory Mode, there will be a third letter involved with some transactions. These are: P = Purchases and O = Orders. This screen is similar to a Transaction Inquiry screen. The purpose of this screen is to allocate transactions for Open Item Vendors against their opposing Transactions. For example: For the entering of a Receipt against the appropriate Invoice. The first time the Vendor Allocation Inquiry screen is displayed, only transactions which have not been fully allocated for the current month, will be displayed as seen in the list below. You then have two options for the viewing of additional allocation records. Use (Command F) keyboard shortcut to display the find pop up as seen below. Extended documentation is in the Navigation and Procedures manual and is listed in the TOC or Table of Contents at the beginning of the manual. This Allocation function is only normally used to allocate invoices to any payments that the business makes to Vendors. However, by selecting the All Records option the user may list transactions that are fully allocated and would not normally be listed. Provided the transaction remains Un-posted the user could then un-allocate the transaction. This would probably be if the transaction has been created and it is required that the transaction be deleted. This screen displays a list with the basic details of each Vendor including ID Name and Address as well as the Telephone number and Main Contact. This will allow easy selection of a Vendor for either Viewing or Modifying. Unless the user has been granted access to Payroll any Vendors that have a Class of SUPER entered will not be displayed in the list of Vendors. Please note that searches performed will only process and display those Vendors who are active. If you require a search on inactive Vendors you must first select the Include Inactive from the Sapphire Tools drop-down menu. This will include all inactive Vendors until such time as you leave the Vendor Inquiry list window. The search will then default back to displaying only active Vendors. SapphireOne does not allow the deletion of Vendors however they may be made inactive provided that the vendor has NO outstanding transactions, in other words a zero balance! If any transactions are actioned against an inactive Vendor the Vendor is at that point automatically made active again. This allows old or inactive Vendors to be tracked with ease. There are exceptions to this rule for further details on the exceptions that may be applied please refer to the ATO web site for more details. The Class Inquiry option allows the grouping of Vendors into standard areas as applicable to your business. This expands the sorting or grouping of your data in the production of reports generated from SapphireOne. Displayed below are the Vendor Classes set up in the Bondi Blue Demo. Once a Class has been selected the Look button will allow you to view the Class (as displayed below) without modifying. The Post Transactions function presents a window which contains all current transactions awaiting posting, listed in date order. This function is for the creation of Payments for Vendors, and then the printing or generation of those payments in different forms or the generation of files. The type of payment for a Vendor is set up on the Terms Page of a Vendor Inquiry. The default setting is by Cheque but by selecting the appropriate checkbox EFT, or BPay may be selected which will generate a Commbiz CSV file for the Commonwealth Bank BPay system. Before any payments are made to Vendors the type of Payments to be made to them must be entered first. This is done by going to a Vendor Inquiry and proceeding down to the Terms Page. The default is Cheque but there are options for EFT and BPay payments. Improve internal efficiency with the ability to record individual address details for vendor’s primary, postal and pickup address. With customisable picture fields available. Tailor your records to reflect information specific to your organisation’s requirements with customisable fields. With 20+ user-defined fields, adapting information particular to your industry is easy. Maintain detailed Supplier information with particulars that include but are not limited to, vendor address, telephone, fax, e-mail, shipping details, payment terms, and complete historical information. Extensive tax settings allow you to enter ATO branch numbers for multiple offices, ABN, handle PAYG and tax file numbers for no ABN vendors. Unlimited history means that you can view all historical transactions, distribution or activity history for a particular vendor. Historical data may be sorted or reviewed by calendar or financial periods giving you the information you require when and where you need it. Getting in touch with the right person will save time, whether contacting sales, accounts payable or the CEO. SapphireOne has a facility to record the details of as many different contacts relating to a vendor as you prefer, including: direct telephone, facsimile or mobile numbers as well as individual e-mail. Each contact also has a notes facility allowing you to keep track of important information or conversations relating to the individual. Add Notes to individual vendor files to assist in tracking important information. All notes are date, time and user stamped, for accurate record keeping. Notes are displayed in chronological order for rapid and efficient viewing. In addition to the standard demographic fields, SapphireOne allows you to enter searchable keywords that relate to the vendor. Designate a single or multiple general ledger accounts to a particular vendor to automatically default on transactions created. Default accounts are modifiable allowing users to reject or accept the default. Customise documentation to suit your business requirements, from the printing of cheques, remittance slips through to purchase orders. Create unlimited vendor classes to classify vendors. Index vendors by product, industry, demographic region or however you require. Analyse all aspects of purchase activity with SapphireOne’s comprehensive reporting functionality. Create new reports or use one of the many standard report templates within SapphireOne. Customise reports to detail the information you wish to view, allowing you to meet your exact requirements and save for future use. Designed with flexibility in mind, reports can be sorted by calendar or financial year with numerous levels of detail to choose from. Comparison accounting means that you are able to review current and past periods with ease and are ensured of accurate information customised to your specific needs. These reports may be up to 12 columns wide if required. Unlimited history means that any transaction can be reported on at any time with the ability to drill down through to the source information. Also at any time, the original transaction can be reprinted, without the need to access an archive of some type. This is particularly useful in audit reviews. From utilities mode the user may also view any transactions of a historical nature going back to when the data file was first started. SapphireOne also has the ability to retrieve these same transactions that are in history back to current, if required for some reason. Employees are able to securely access SapphireOne over the Internet, receiving or modifying information in real-time, extending the boundaries of your office environment. Create, modify and post transactions and records. Distribute financial reports electronically allowing circulation of vital data. Receive accurate data and make informed decisions without the need to be physically present in the office environment. Retrieve vendor information from contact details, credit limits, historical purchasing to make educated decisions or efficiently respond to queries. Review purchases activity by period, calendar or a financial year, or analyse the trends of purchases via a local area network or via the internet. Double entry is a thing of the past with SapphireOne Automated Entry feature. Vendor details are dynamically imported to all transactions including address details, prompt discount rates, tax codes, tax rates, currencies, purchase reps. Default information can be overwritten if required. Allocate payments to an invoice linking the transactions for easy tracking. This function is particularly useful when paying multiple invoices with one cheque. With SapphireOne print cheques when entering vendor invoices and allocate the transaction for immediate payment. Add credit limits for your organisation that apply to a particular vendor, preventing the creation of purchase orders over and above your credit limit, while still permitting vendor payments. Automatic notification when your company has reached its credit limit. Revise credit information while entering transactions ensuring transactions are processed correctly and efficiently. Automate your cheque runs, with the ability to preselect vendors to apply payments to. At any stage adjust or add vendors to your selection. For one-off payments, SapphireOne’s cash payment option may be used to record details such as who the payment was made to, what it was for, amount, and reference number without having to create a complete vendor file. Flag vendors for periodic payments, with the flexibility to set-up monthly, yearly, credit period or lifetime payments. Standing transactions that have been created are easily modified or cancelled, allowing you to control when payments are made. SapphireOne allows you to set-up a master vendor (parent) with as many subsidiaries, franchisees, related companies, divisions or departments (children) as required linked to the master vendor. The parent and children can run independently of one another with the advantage that payment to the parent organisation can be allocated to multiple children’s invoices. SapphireOne’s foreign exchange handles transactions in any currency, allowing your organisation to purchase from regional and worldwide markets. With complete export/import manager, on costing and inventory control, overseas commerce is easier than ever before. Delete transactions with the click of a button while retaining a thorough audit trail. All negated transactions can be searched and retrieved at any point in time. Perform simple or powerful queries on every field and file relating to purchase transactions, payments and supplier movements, this means that you are able to search by the external reference number when vendor or purchase order numbers are not available. Detailed searches can be saved for use in the future, with the added benefit of being able to create and save reports based on the search results. SapphireOne automates the processes required to effectively manage your expenses and purchases. All functions from the processing of purchases through to the bank reconciliation are all in real time. Transactions within payable are updated across the system to the General Ledger immediately. Full integration is the key to the SapphireOne solution. SapphireOne payables presents an accurate overview of the positions of your business at any given time, proving features such as automated cheque runs, electronic funds transfer (ABA EFT) and allocation of payments.